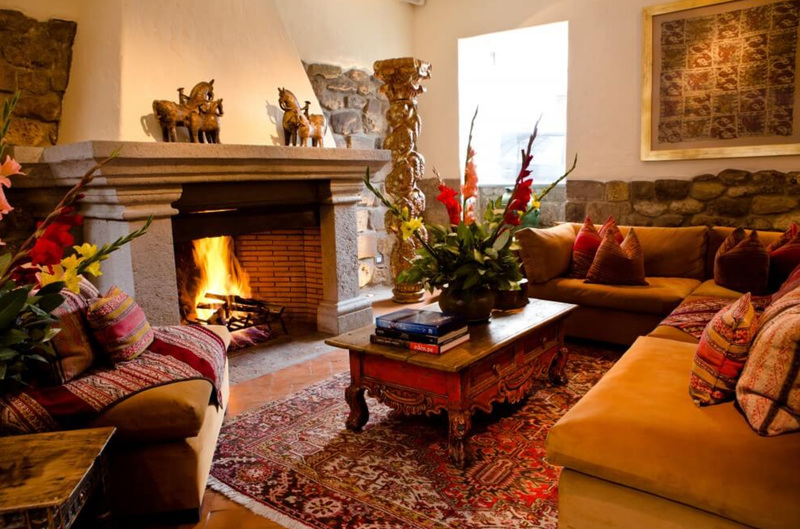 We arrived at the La Casona Inkaterra Boutique Hotel in Cusco around 11:00 am, well before the check-in time. The hotel has no reception “per se”, so we were placed in a room filled with antique objects and paintings, and were brought towelettes to freshen up with and muña tea, an alternative to coca tea that helps with altitude sickness. Everything smelled of eucalyptus! While the hotel staff collected our documents we were told that they would do an early check-in for us, which we appreciated after catching an evening flight from Miami, meaning we were quite tired. When everything was ready, we were shown to room number 3. 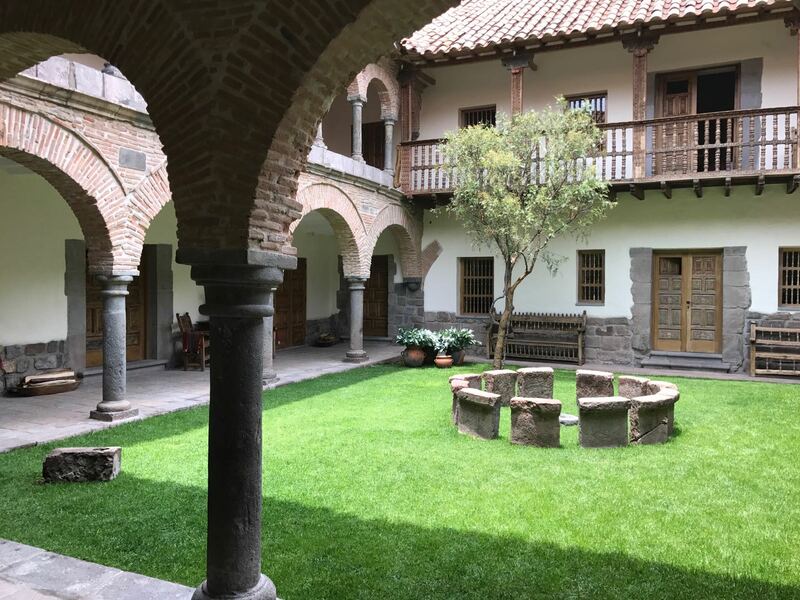 To get there, we had to pass through the central courtyard, a typical open Spanish courtyard with a large green garden, which let in natural daylight. On one side of the yard there was a big bowl of fresh fruit which was available for free all day long… Just looking to the side of the courtyard reminded me of the old houses in southern Spain, especially in Andalusia (with some Arab heritage) and made me feel as if I had travelled to medieval times. Everything was so authentic, made of stone and wood, just like the quality constructions from olden times! 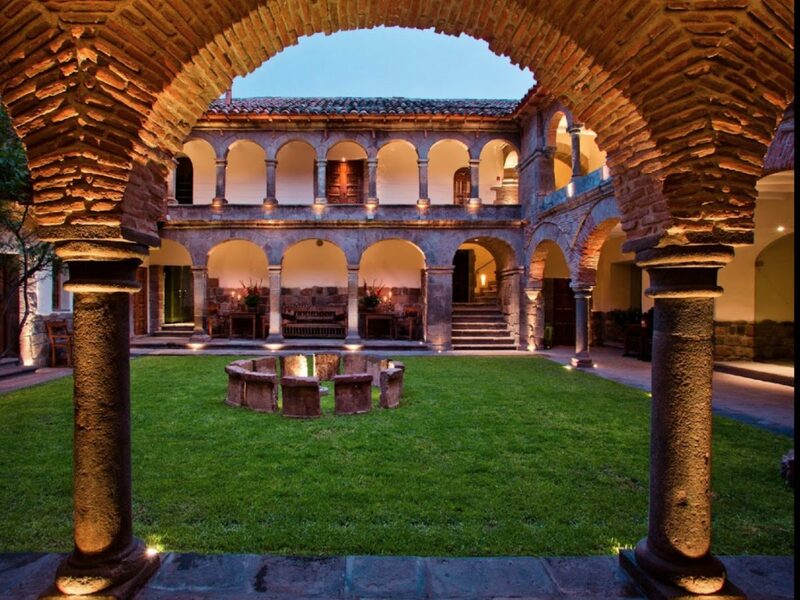 The mansion is from the sixteenth century, and after its construction, among its former illustrious guests, it hosted the Spanish conquistador Diego de Almagro and Simon Bolivar, so one can imagine what this house represented at the time. The hotel has eleven suites, spread over two floors that are equipped with fireplaces, radiant floors and large bathtubs in the middle of each bathroom. 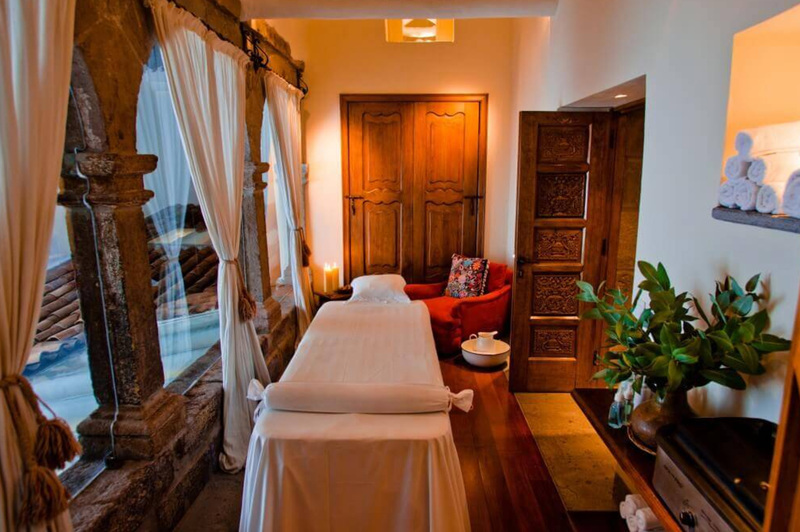 The rooms are decorated with colonial furniture and paintings, pre-Colombian fabrics, and with great attention to detail that transports guests through time and allows for a glimpse at what life was like during that era. 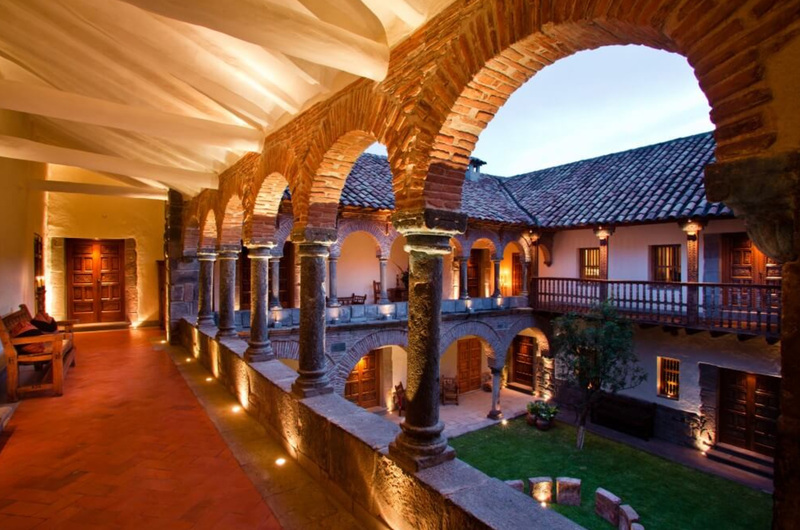 The La Casona Hotel is located in the traditional Plaza de las Nazarenas, a short walk from the historic center and close to absolutely everything that is relevant for a tourist in Cusco. The bathroom area is worth mentioning. It is not only huge but also features many details. It has a shower, a separate bathtub, a toilet area, two separate sinks with individual mirrors, large wardrobes, a safe, bathrobes, etc… You can literally go for a walk in the bathroom while enjoying the wonderful smell of eucalyptus coming from the bedroom. Having cooled off a bit and unpacked, we set out to stroll through the center. It took literally 30 seconds to reach the main square of the city. We only had to go down a hill and there we were, in front of the huge square surrounded by ancient churches and full of people. That square gave off a positive vibe… there were hundreds, perhaps thousands of people walking and running in different directions. Maybe 50% were tourists from all over the world, speaking many languages and taking pictures with women dressed in local garb and carrying small alpacas, as if they were puppies. What a wonderful experience. 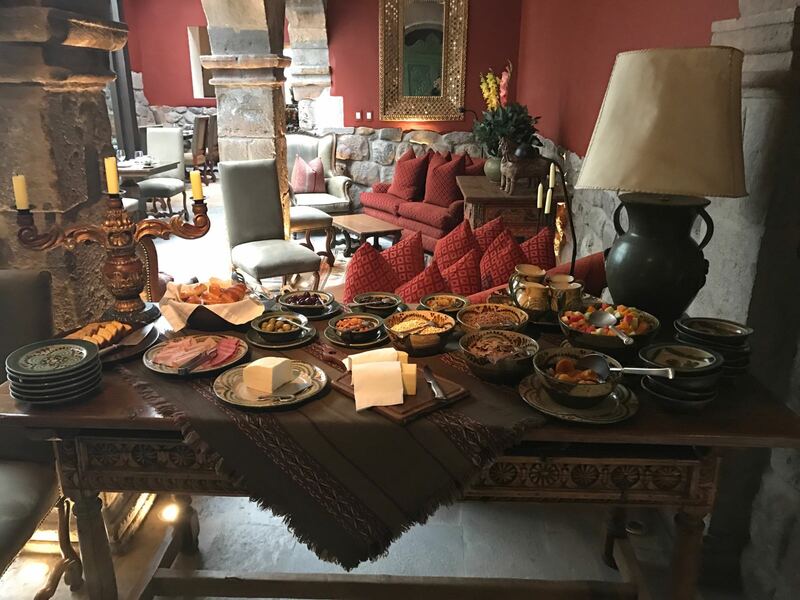 After eating at The Limo Restaurant, just around the corner from the La Casona Hotel and one of the best restaurants in Cusco, we headed to the hotel for a nap. However, before laying down, we called to see if someone could turn on the fireplace in the room (they all have one). Within five minutes, a very kind girl came with lots of wood and lit the fireplace in less than a minute. It would have taken me a half hour but this girl literally did it in 1 minute and of course, did it for free! What more could we ask for? Ah yes, a muña tea, and it was time to sleep. After the siesta, we set out to explore a little more of the city and plan excursions for the next day. Altitude sickness began to take effect on me and made me feel tired, with a slight headache. During our walk around the town we were drinking coca tea (thinking it would be stronger than the muña) but the truth is that it didn’t help much. Our friends at the hotel, Sylvia and Samuel, put us in touch with a driver who gave us a private tour service during the following day and proved to be the best thing we could have done. The service was very affordable, comfortable, helpful and respectful. During the next day, we visited Moray, the Maras Salt Mines and Saksaywaman. An otherworldly experience! 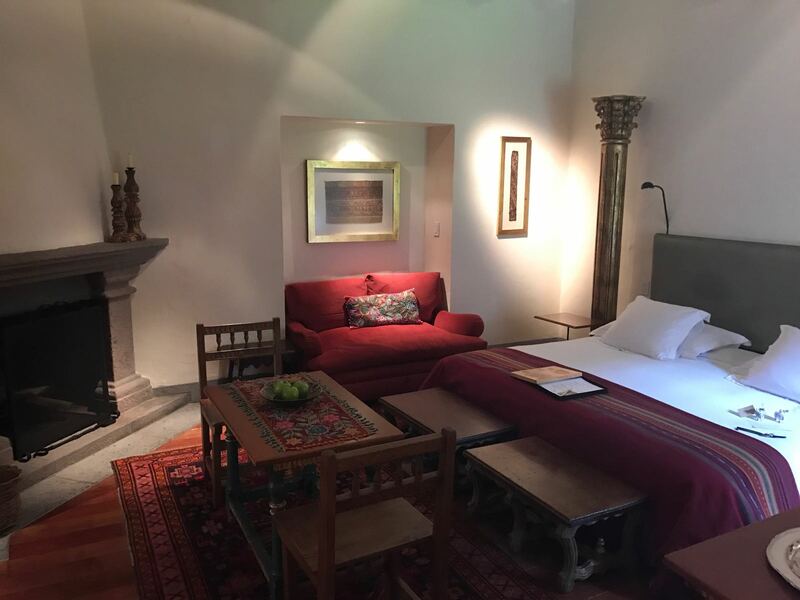 Of course, at the end of the day, we were looking forward to our private paradise, that is, the La Casona Hotel where we knew we would have all the necessary luxuries after a tiring day. On the way to our room, we passed by the main courtyard once again and saw all the lights lit up, creating a warm and very friendly atmosphere. Beside one of the stone walls in the courtyard were two tables, one for each couple, with a lit candle inviting us to sit for dinner! It was a dreamy image, very romantic. Before going to sleep, we asked to have the fire lit again. We love sleeping with the background noise of the fire and with its heat. The next morning, we headed to breakfast for the last time. For starters, a hot muña tea to whet your appetite, followed by fruit juice and pineapple, bananas and mandarins. Then came the main course, that is, eggs with bacon, sausages and everything else a thousand and one ways. The only thing we had to do was make a selection from the varied menu. In addition, there was a buffet of sweets with all types of local pastries that you could imagine. 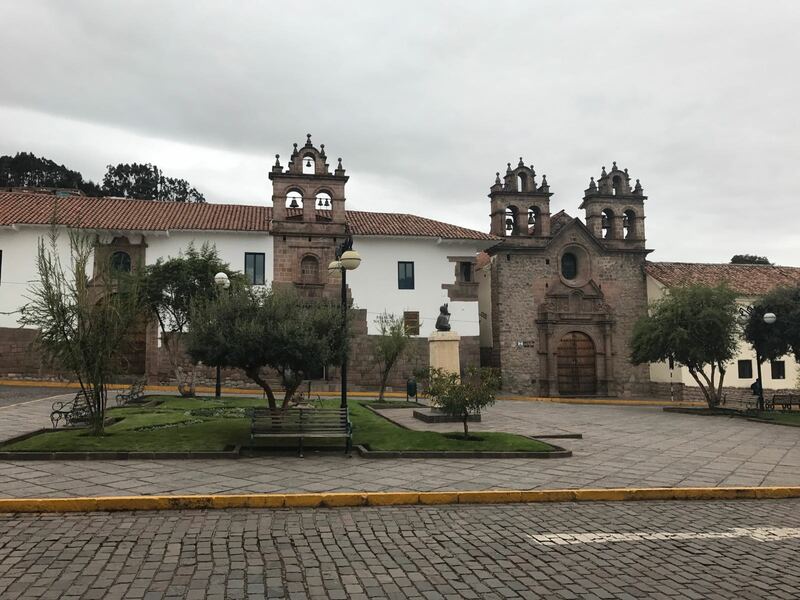 After breakfast, we said goodbye to the excellent staff who had behaved exquisitely, and took a taxi to the train station located about 20 minutes from Cusco. The Peru-Rail train leaves from here and takes you to the area of Machu Picchu (Aguas Calientes). 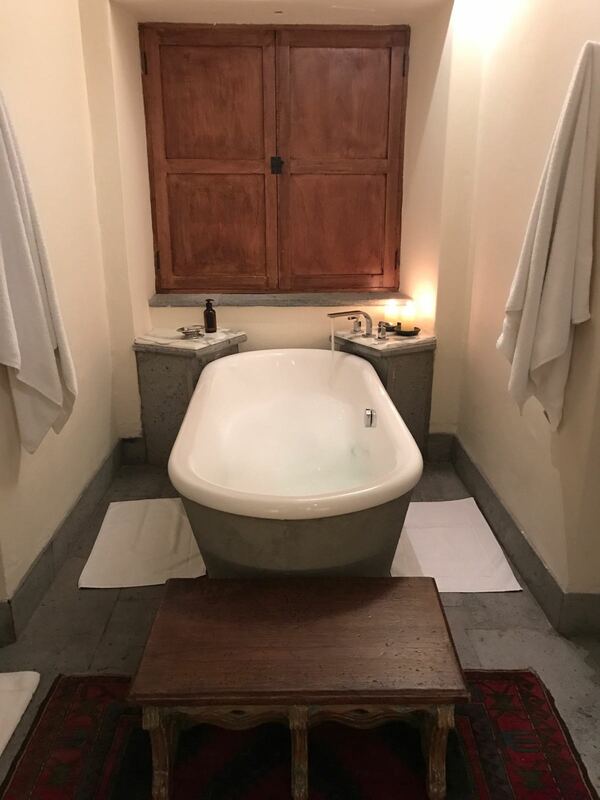 We left behind the wonderful 5-star La Casona Inkaterra Hotel, a fantastic hotel, with a medieval touch that took us back in time and made us feel very special.